Thai style vegetable curry, with added zing! And kerpow! I don’t tend to mess too much with Thai curries, at least not with their spicing. The rest of the ingredients are usually fair game though. But this time I decided to go one step further. It probably helped that the recipe I first looked at was written by Nigel Slater in The Observer. And I feel comfortable with Nige (as he is known at home) and his recipes. After all, Real Fast Food was the first cookbook I ever owned. The recipe was for something zingy which is pretty much exactly what I was after. It’s one of the two answers to this cold, drizzly weather, the other being meaty comfort food. I wanted something to lift my mood, make my mouth, brain and belly feel alive. And so it did. 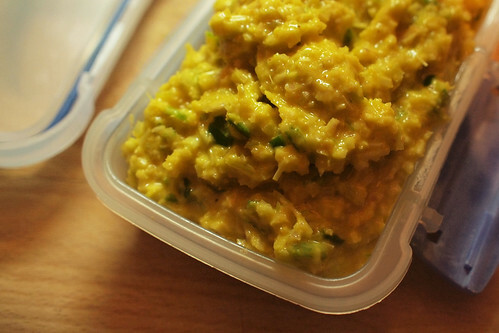 I tool Nige’s curry paste and added extra zing, and maybe just a dash of kerpow. I upped the heat quotient, and chucked in a big old lump of ginger. And it worked perfectly. Finally, and I tend to be constitutionally incapable of doing otherwise, I added other ingredients of my own. Mrs Grubworm’s suggestion of oyster mushrooms was particularly inspired as they soaked up those delicious juices and added much needed texture. You can make this totally vegetarian by omitting the fish sauce, but you would need something unorthodox to help add depth. Umami paste or mushroom ketchup might do the trick. I’d also not bother with seeding any of the chillies next time. I like my heat. Blitz all of the paste ingredients together in a blender until you have a rough paste. Don’t worry too much about getting a perfect puree. 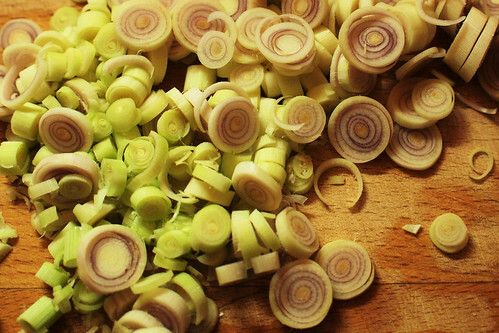 Chop all the celery, greens and mushrooms into bite sized pieces. heat some oil in a wide pan or wok, add the paste and stir until the aromas start to rise up. Add the spring onions (white bits only) and mushrooms. Stir and fry for 3-4 minutes. Add the celery and pak choi stalks. Cook for another couple of minutes. Pour in the stock, then chuck in the leafy bits of the greens and simmer until they are tender. Now pour in the fish sauce, soy, sugar and lime juice, adjust to your taste. Put the rice noodles in bowls and spoon over the sauce and curry and garnish with the coriander leaves and spring onion greens. @s It did taste pretty good – i love how those different flavours play on different parts of your tongue. @shuhan – it’s funny, shrimp paste is one of those ingredients it;s not that easy to get hold of over here (Asian grocers excepted) but it does add a certain pungent depth to proceedings. I’m still a relative novice when it comes to cooking this sort of food and really must get hold of some more shrimp paste to play with methinks!